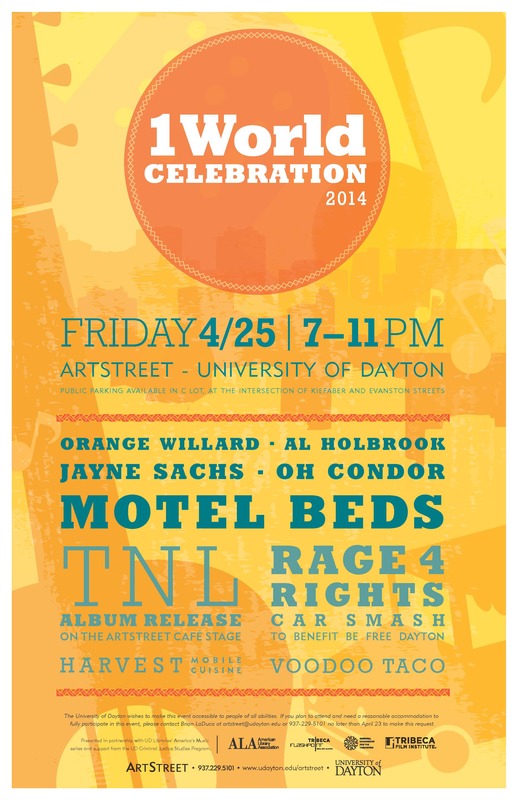 On April 25th from 7 to 11pm — several great Dayton bands, The Motel Beds, Oh Condor, Al Holbrook, Jayne Sachs, and Orange Willard will play at the ArtStreet Complex of the University of Dayton! We are celebrating this terrific show by playing music from all of these bands! You can also expect tons of new music. You can also expect some music from The Broken Lights, SHRUG, Smug Brothers, King Elk, Built to Spill, The Pastels, Old 97’s, Manchester Orchestra, The Capsules, Ex Hex, Real Estate and Absinthe Junk. In case all of this was not fun enough — we have brand new music from Sad Cadillac – they just played out at The Canal Public House! What a show! Yeah, whew… But wait because if all of this was not enough we have a preview of some new music from Andy Smith‘s new project, Me Time! So, join Dr. J and Mrs. Dr. J as we preview the upcoming 1World show. Join us as we play some great music from The MotelBeds, Oh Condor, Al Holbrook, Jayne Sachs, and Orange Willard and discuss the 1World event on April 25th! This event is not only awesome — its free! Remember you can listen on wudr.udayton.edu or via the new UD Mobile App or those ol’ radio waves at 99.5 and 98.1fm in Dayton! You can get the UD Mobile App here!